Introduction : Laparoendoscopic single-site donor nephrectomy (LESS-DN) is a procedure in evolution. Currently described techniques utilize single port access devices and articulating, flexible, and bent working instruments. 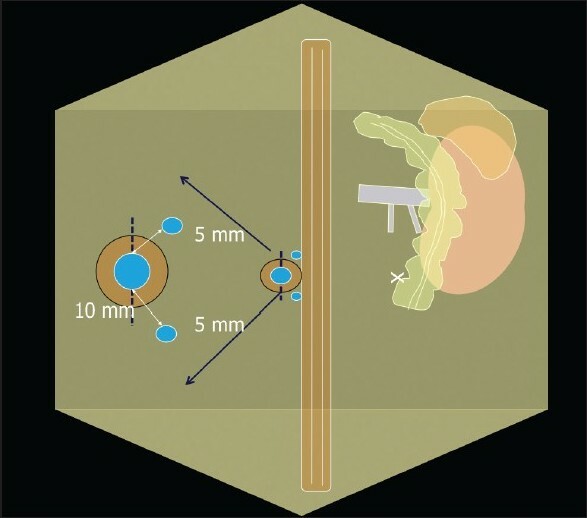 We describe a modified technique of transumbilical LESS-DN with conventional laparoscopic instruments in five kidney donors. 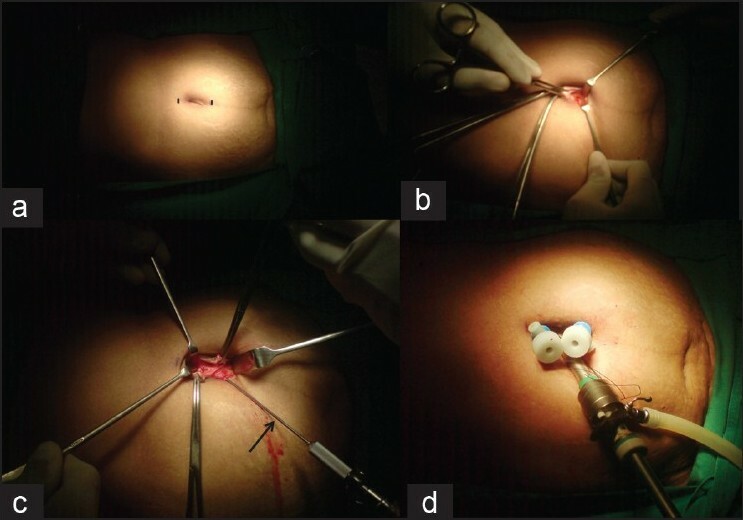 Materials and Methods : Three standard laparoscopic ports (10 mm x 1, 5 mm x 2) were placed through a 4.5 cm vertical transumbilical incision. A 10 mm 45°, long bariatric lens (Karl Storz) was used. Renal mobilization was performed using conventional rigid laparoscopy instruments. A port closure needle loaded with a blunt plastic needle cap was used for traction. After hilar clamping, an incision was made connecting the three ports, and the kidney was extracted using a preplaced suture over the lower pole fat. All data were prospectively recorded. Results : LESS-DN was performed successfully in all five patients. The mean operative time was 157.2 minutes (range, 134-184) and the mean warm ischemia time was 3.2 minutes (range, 3-4). All donors were discharged on postoperative day 3 and were able to resume normal physical activity by 2 weeks after the procedure. All donors had an excellent cosmetic outcome. The mean serum creatinine (recipient) at discharge was 1.14 mg% (range, 0.9-1.4). Conclusions : Transumbilical LESS-DN can be cost-effectively performed using conventional laparoscopy instruments and without the need for a single port access device. Warm ischemia times with this technique are comparable with that during conventional multiport laparoscopic donor nephrectomy. Multiport laparoscopic donor nephrectomy has become an established technique of organ harvesting. ,,,[ 4] In an attempt to further improvise donor outcomes, laparoendoscopic single-site donor nephrectomy (LESS-DN) has been recently introduced. ,, Though prospective randomized trials with this technique are lacking, LESS-DN has been shown to be associated with decreased donor morbidity and better cosmesis. This surgical approach is still in evolution, as only three case series with small number of patients have been reported so far. ,, The techniques for LESS-DN reported by Canes et al. and Ganpule et al. described the use of disposable transumbilical single port access devices, digital laparoscopes with an integrated camera head along with curved and articulating working instruments. Andonian et al. preformed the procedure through a Pfannenstiel incision, using extra long instruments and a flexible tip laparoscope. Utilization of such instruments and disposable access ports can impose a significant cost burden on patients in developing countries. With a prior experience of more than 300 conventional laparoscopic donor nephrectomies by one of us (D.D. ), we have recently commenced our LESS-DN program. We have successfully performed five transumbilical LESS donor nephrectomies using conventional laparoscopy instruments, without the need for single port laparoscopy access devices. We herein report our modifications and feasibility of this cost-effective technique of LESS-DN. Between January 2010 and April 2010, five kidney donors were selected to undergo LESS-DN. Demographic details are as outlined in [Table 1]. All patients underwent left-sided LESS-DN, and all had a single renal artery and vein. Warm ischemia was defined as the time between the application of the first Hemolok clip on the renal artery and the initiation of cold perfusion of the kidney on the bench. Data were prospectively recorded. The patient is placed in a conventional 45 o lateral position as for multiport laparoscopic donor nephrectomy. 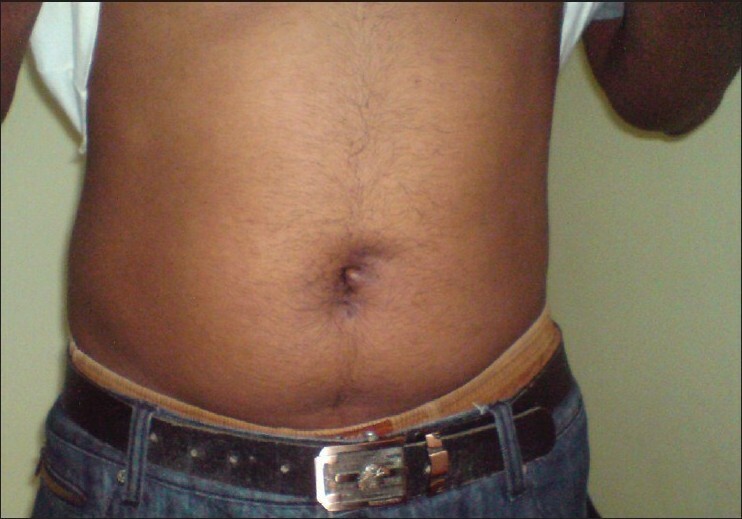 The upper and lower edges of the skin incision are marked 1 cm above and below the umbilicus. The umbilicus is then everted and 4.5 cm long vertical transumbilical incision is made. The rectus fascia is laterally dissected underneath the skin flaps. Pneumoperitoneum is established using a Verees needle inserted through the rectus fascia in the midline. Three separate vertically aligned ports (one 10 mm and two 5 mm ports) are inserted through this single incision [Figure 1] and [Figure 2]. A 46 cm long, 45 0 (bariatric) laparoscope (Karl Storz) is used through the 10 mm camera port. A fascial (port) closure needle (Karl Storz GmBH and co, Tuttlingen, Germany) is inserted intra-abdominally through the left subcostal region. The upper part of an infant feeding tube is cut and fed into the open end of a plastic needle cap. The cap is inserted into the abdomen through one of the 10 mm ports .The port closure needle is passed into the open end of the needle cap through the rubber of the feeding tube. This arrangement allows for a snug and secure placement of the port closure needle into the needle cap. This assembly is used to provide traction to the kidney and adjacent organs [Figure 3]. The descending colon is mobilized along the white line of toldt, exposing the ureter and the gonadal vein packet. This is dissected off the psoas and lifted up to (and) expos (ing) the renal vein. Subsequently, the adrenal vein is dissected, ligated, and divided. The renal upper pole is freedfrom the adrenal gland and other posterior abdominal wall structures. The renal artery is exposed after ligating and dividing the lumbar vein. The kidney is mobilized completely all around, exposing the psoas muscle. The gonadal vein and ureter are divided at the pelvic brim. At this point, a window is made in the lower pole fat and a no. 1 vicryl suture is tied around the fat including the gonadal vein. This suture is exteriorized through one of the ports and used for kidney extraction [Figure 4]. Prior to renal hilar clamping, the lower 5 mm port is exchanged for a standard metallic 10 mm port. The renal artery is clipped with two Hemolok clips and divided. The renal vein is clipped using one Hemolok clip and divided. A rectus fascial incision is made, connecting the three laparoscopic ports. The vicryl thread tied to the lower pole fat is pulled and kidney delivered along its transverse axis into the wound. After kidney retrieval, the port closure needle is brought into the umbilical wound and needle cap is removed. The skin incision is closed with interrupted no.1 vicryl sutures and working ports are reinserted in between sutures. Hemostasis is ensured. LESS-DN was successfully completed in all five patients. The mean operative time was 157.2 minutes (range, 134-184 minutes). The mean intraoperative blood loss was 150 cc (range, 135-180 cc) and the mean warm ischemia time was 3.2 minutes (range, 3-4 minutes) [Table 1]. The final length of the skin incision was 4.5 cm in all cases. The fascial incision was 5 to 6 cm long. None of the patients required extension of the skin incision during kidney extraction. All recipients had brisk urine output on completion of anastomosis, and mean serum creatinine at discharge was 1.14 mg% [Table 1]. In developing countries like India where cadaveric organ donation is still in its infancy, living organ donation remains the prime driver for renal transplantation. Laparoscopic donor nephrectomy has become the gold standard for harvesting kidneys, as numerous trials have shown that it is associated with improved outcomes in comparison with open donor nephrectomy. ,, Laparoendoscopic single-site surgery for nephrectomy was first described in 2007. Subsequently, Gill et al. demonstrated its feasibility for donor nephrectomy in their initial report of four cases. There have been three further case series of LESS-DN from centers performing high volume of urological laparoscopy cases. ,, These studies have demonstrated that LESS-DN can be safely performed by urologists who are proficient in laparoscopy. Our LESS-DN programme was started with a background of one of us (D.D.) having performed more than 300 conventional laparoscopic donor nephrectomies and the second (S.G.) having an experience of more than 50 LESS gastrointestinal surgical procedures. Before embarking on LESS-DN, we developed our LESS technique for a variety of urological operations like simple and radical nephrectomy, nephroureterectomy, adrenalectomy, heminephrectomy, and pyeloplasty. Our technique of LESS-DN differs from that reported by others and we herein discuss its advantages. Canes et al. and Ganpule et al. used the R-port (Tri-port and Quadport-Advanced Surgical Concepts, Dublin, Ireland) to provide access for LESS-DN. We did not use access ports in any of our cases. Our technique of port insertion is similar to the one described by Raman et al., where 5 or 10 mm working ports are directly inserted through the rectus fascia, under the umbilical skin flaps. LESS access ports are meant for single use and can be expensive for patients in developing countries. The current cost of the Triport and Quadport ranges between Rs 25 000 and Rs 40 000. Moreover, we feel that these ports are associated with limited maneuverability of working instruments, as the fulcrum for movement is at the level of the access port. There is greater freedom of movement of working instruments when laparoscopy ports are directly inserted through the fascia. One of us (S.G.) has performed gastrointestinal LESS procedures using both the SILS port (Covidien plc, Dublin, Ireland) and direct port insertion, and found the latter technique to be more surgeon friendly. It is well-accepted that retraction of structures like the spleen, pancreas, kidney, and large bowel provides tissue traction, which facilitates laparoscopic dissection. In 11 of their cases, Ganpule et al. used either a 3 or 5 mm port for retraction, whereas Canes et al. used a 2 mm instrument for the same purpose. In our opinion, addition of extra ports does not qualify the procedure to be labeled as 'classic' LESS. Also, 2 or 3 mm instruments have sharper ends and have the potential to cause injury when used for traction. We have used the port closure needle (diameter 1.5 mm) fitted with a plastic needle cap intracorporeally to provide retraction. This obviates the need of any extra skin incision and the plastic cap (which has a blunt wide rounded end) that can provide atraumatic, robust retraction of organs like the spleen, upper pole of the kidney, large bowel, and pancreas during renal and hilar mobilization. We have found this to be an extremely useful adjunct to renal dissection. We used a 10 mm, 46 cm long bariatric 45 o bariatric laparoscope lens fitted with a HD camera. Due to its extra length, the camera head is at a distance from the handles of the working instruments. This allows the camera driver to sit comfortably and prevents clashing of hands between the camera driver and the operating surgeon. The 45 o bariatric lens provides a view from 'above' that allows the instruments to work at a 'lower' plane, and this minimizes intracorporeal clashing. Andonian et al. used a 5 mm flexible tip laparoscope and found the vision to be inferior in comparison with standard 10 mm rigid laparoscopes. Gill et al. and Ganpule et al. used a 5 mm digital laparoscope with an integrated camera head. All three reported studies of LESS-DN described the used of articulating, extra long and curved working instruments. These instruments are high cost, high maintenance devices and require familiarization to work with. In an experimental study, Stolzenburg et al. found prebent and flexible instruments to be more time-consuming in comparison with standard laparoscopic instruments for the performance of laparoscopic tasks. We have used standard rigid laparoscopy working instruments along with a standard length harmonic scalpel, thereby decreasing the amount of investment required for setting up infrastructure for starting a LESS program. The warm ischemia time in our first case was 4 minutes and in the subsequent four cases, it has consistently been 3 minutes. We feel our technique of kidney extraction is safe, as the suture around the lower pole fat, when pulled, aligns the transverse diameter of the kidney in line with the incision on the rectus sheath and allows for quick extraction of the kidney. The potential for losing the graft in the abdomen during retrieval is also annulled. Canes et al. have used an endocatch bag for kidney retrieval and reported a mean warm ischemia time of 6 minutes. In one of their patients, a large kidney could not be prebagged before hilar clamping. This required the kidney to be bagged under warm ischemic conditions, extending the warm ischemia time to 10.2 minutes. The median warm ischemia time in the series of Andonian et al. was 5 minutes and that reported by Ganpule et al. was 6.79 minutes. In a matched pair retrospective comparison of conventional laparoscopic donor nephrectomy and LESS-DN, Canes et al. demonstrated significantly reduced pain requirement in the period after discharge and earlier to return to normal physical activity in the LESS group. We too have observed these benefits in our LESS donors, as all of them were able to return to work by 2 weeks after the operation. The cosmetic results were also gratifying. In a comparison of patients undergoing LESS nephrectomy and conventional laparoscopic nephrectomy, Raman et al. reported only a cosmetic advantage for patients in the LESS group. Similarly, in a small retrospective series, Andonian et al. demonstrated only a cosmetic advantage for LESS donors compared with donors undergoing conventional multiport laparoscopic donor nephrectomy. It is evident that randomized prospective trials are required to clearly delineate the role of LESS-DN for kidney donation. Our technique does not impose an added cost burden on patients, is ergonomically balanced, and can be performed with minimal added inconvenience to surgeons. Encouraged by our early experience, we have embarked on a prospective randomized trial to compare LESS-DN with conventional multiport laparoscopic donor nephrectomy. We have demonstrated the feasibility of LESS-DN with conventional laparoscopic instrumentation, without compromising on the surgical principles of donor nephrectomy. Our early experience suggests a definitive cosmetic advantage and earlier return to work for LESS donors. Further prospective trials will be required to confirm the true place of LESS-DN. 1. Nanidis TG, Antcliffe D, Kokkinos C, Borysiewicz CA, Darzi AW, Tekkis PP, et al. Laparoscopic versus open live donor nephrectomy in renal transplantation: a meta-analysis. Ann Surg 2008;247:58-70. 2. Chung E, Grant AB, Hibberd AD, Sprott P. Why potential live renal donors prefer laparoscopic nephrectomy: a survey of live donor attitudes. BJU Int 2007;100:1344-6. 3. Nicholson ML, Kaushik M, Lewis GR, Brook NR, Bagul A, Kay MD, et al. Randomized clinical trial of laparoscopic versus open donor nephrectomy; Br J Surg 2010;97:21-8. 4. Ratner LE, Montgomery RA, Maley WR, Cohen C, Burdick J, Chavin KD, et al. Laparoscopic live donor nephrectomy: the recipient. Transplantation 2000;69:2319-23. 5. Gill IS, Canes D, Aron M, Haber GP, Goldfarb DA, Flechner S, et al. Single port transumbilical (E-NOTES) donor nephrectomy. J Urol 2008;180:637-41. 6. Canes D, Berger A, Aron M, Brandina R, Goldfarb DA, Shoskes D, et al. Laparo-Endoscopic Single Site (LESS) versus standard laparoscopic left donor nephrectomy: matched-pair comparison. Eur Urol 2010;57:95-101. 7. Ganpule AP, Dhawan DR, Kurien A, Sabnis RB, Mishra SK, Muthu V, et al. Laparoendoscopic Single-site donor nephrectomy: A single centre experience. Urology 2009;74:1238-40. 8. Andonian S, Herati AS, Atalla MA, Rais-Bahrami S, Richstone L, Kavoussi LR. Laparo-endoscopic single-site Pfannenstiel donor nephrectomy. Urology 2010;75:9-12. 9. Raman JD, Bensalah K, Bagrodia A, Stern JM, Cadeddu JA. Laboratory and clinical development of single keyhole umbilical nephrectomy. Urology 2007;70:1039-42. 10. Raman JD, Bagrodia A, Cadeddu JA. Single-incision, umbilical laparoscopic versus conventional laparoscopic nephrectomy: A comparison of perioperative outcomes and short-term measures of convalescence. Eur Urol 2009;55:1198-206. 11. Stolzenburg JU, Kallidonis P, Oh MA, Ghulam N, Do M, Haefner T, et al. Comparative assessment of laparoscopic single-site surgery instruments to conventional laparoscopic in laboratory sitting. J Endourol 2010;24:239-45. 12. Andonian S, Rais-Bahrami S, Atalla MA, Herati AS, Richstone L, Kavoussi LR. Laparoendoscopic single-site pfannenstiel versus standard laparoscopic donor nephrectomy. J Endourol 2010;24:429-32. Moftah, M. and Sehgal, R. and Cahill, R.A.
Piros, L. and Langer, R.M. Humphrey, J.E. and Canes, D.
Ganpule, A.P. and Mishra, S. and Sabnis, R.